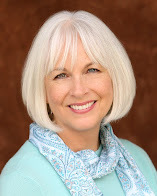 My last newsletter was about Random Acts of Kindness. I love the idea of spreading a positive ripple effect out into the world. There are so many opportunities to do so. As I was grocery shopping today I passed 3 women pushing carts who would not make eye contact. My goal was to say "hi" and give them a big smile but they went right past me without looking up. I was wondering what was going on in their heads. Were they sad, focused, insecure, bashful, I have no idea. I think we need to keep our heads up and look the world straight in the eye. Maybe if we do we will meet a new person or someone who has a nice smile to share. 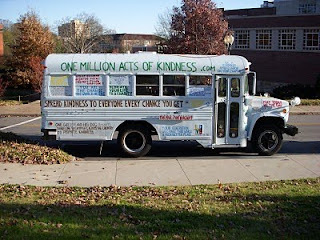 I just read about this man and his dog who are traveling across the country in a bus promoting One Million Acts of Kindness. It is a wonderful idea and this man has been having a great time spreading the idea. Check out his website at: One Million Acts of Kindness. I am sure you will enjoy reading about his story like I did.